This morning I woke up to the news that a couple friend lost their loved one hours before. Suddenly I felt a pang of pain inside me... knocking the breathe out of me, bringing back the sad memories... so overwhelming. Few hours later, the sky turned dark and it started a light drizzle, so feathery light, as if it is trying to comfort me. After that it started to rain and it poured, as if trying to help me get all my emotions out so that I can feel better again. 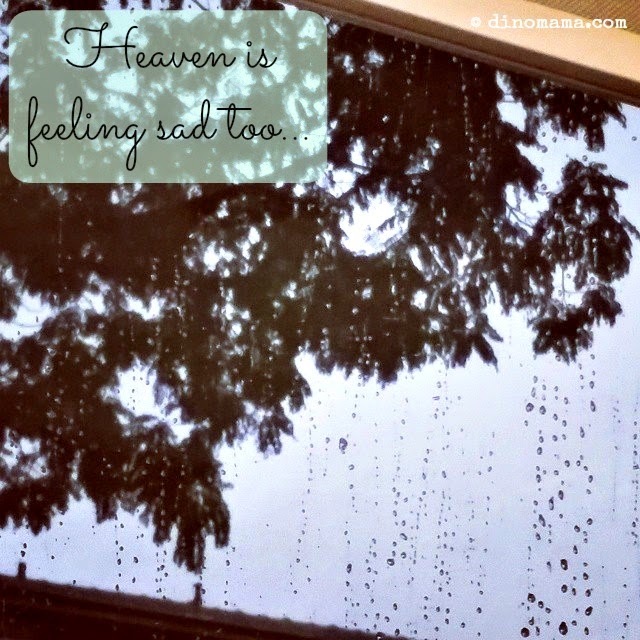 Heaven, are you trying to let me know that some one up there is heartbroken to see that I am feeling sad? The wife friend wrote on her facebook a heartfelt farewell message to her father-in-law, she ends the message with this - "I will have that bowl of rice with soy sauce and egg with you one day. This time I will open my bottle of jasmine tea myself." and it made me think so fondly of my late parents. I'm sharing a bottle of Guiness stout with my Dad while we watch the tv program, in silence. I'm enjoying a hearty chap-pa-lang (a colloquial slang meaning a mixture of things or in this case mixture of several ingredients) porridge and chatting away with Mum. Till we meet again at the other side Mum & Dad, I am missing both of you now. Heaven, please don't cry for me. Please tell Mum & Dad that I will wipe away my tears and be strong again. I think grief is a burden that we will carry for the rest of our lives on this earth. It may get easier to bear over time, but it will always be there. Big hugs Jen. I'm glad you had such lovely memories of your time with your parents. I'm sure you and Dinoboy will create lots and lots together too! Thanks Adora! We weren't very close when I was younger and by the time I understand the reason they treated me they way they did, I was all ready to know them all over again but time was too short before they leave me forever. Nevertheless I am glad I had the chance to do that. You must remember there is always sunshine after the rain though there is nothing wrong reminiscing about the past. I have to remind myself my father-in-law is no longer suffering in pain and he is now probably kiao kar-ing somewhere comfortably, listening to his favourite oldies tunes on his multiple fancy gadgets. Yes. He is a bigger tech geek than my husband. Big warm hugs from me to you. It will get better my friend. It will get better. Liza, ya lah tt rice n jasmine tea makes my nose sng sng after reading u know. Deep inside I know they are enjoying themselves but u know lah its just me that couldn't let go. Thanks Florinda~ Tight tight one ok? Oh dear, I can only imagine your pain. The photo makes me tear already, not to mention your words. Big big hugs. Big hugs to you too Summer! Sorry to be so late... Big hug!!! Hope you are feeling much better now. XOXO. Its never too late to show some love and concern to some one =) Thanks Pc!